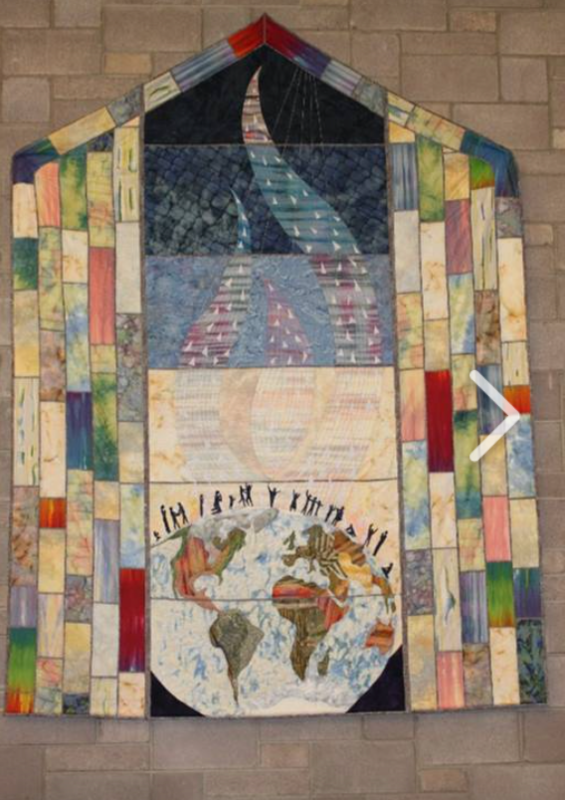 One of the most striking parts of our church is the collection of beautiful quilts hanging in our sanctuary. 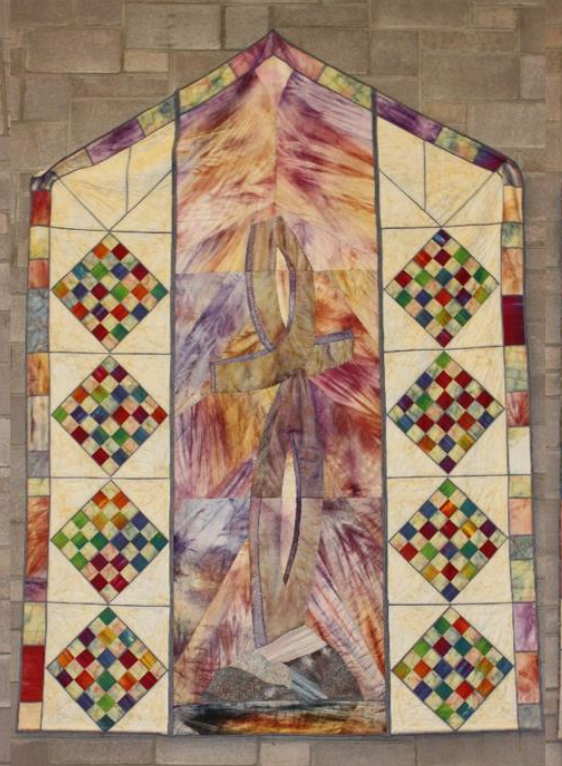 Created by our members, these quilts are a beloved focal point of the worship experience at First Congregational–our own “stained glass windows” in fabric. 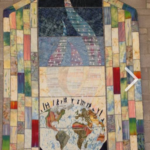 Take a tour of the quilts, prepared by Church Members Joanne Wietgrefe and Enid Zollweg. Communication reflects the dialogue between people and God. It’s a universal theme which occurs when people of any religious belief address a higher power with their thoughts and prayers. People shown in silhouette are standing on the edge of the world in various positions of prayer. Their prayers are represented by triangles wafting heavenward, traveling through the atmosphere which gradually darkens to outer space. Since communication travels in two directions, constant rays stitched in ribbons, are descending from one source. They are words from the Supreme Being spreading over the entire earth. One quilt is brightly done by curved piecing with high contrast. Prayers here are meant to be direct, insistent and pleading. 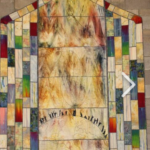 Its companion on the opposite wall uses the hand dyed cloth without any cutting or piecing to indicate quieter times of communication with God. Triangles here are subtle, using trapunto stitching to form them while the rays from above have little contrast. Both are exactly the same design, the different effects are created by using different techniques. 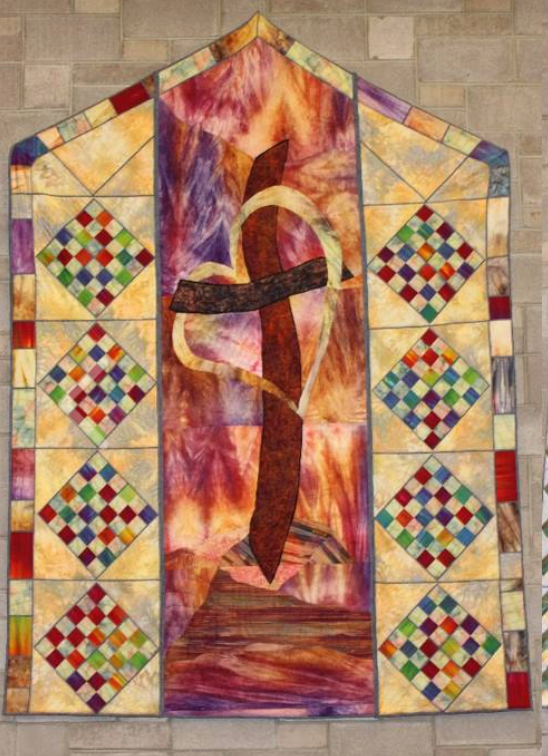 The next two quilts display the central theme in Christianity, the cross. God So Loved…. made for children to easily recognize and understand. A cross formed with two sticks and a heart intertwined suggest songs and verses we all heard as children. Folded and scrunched fabric gives the textured look of bark. 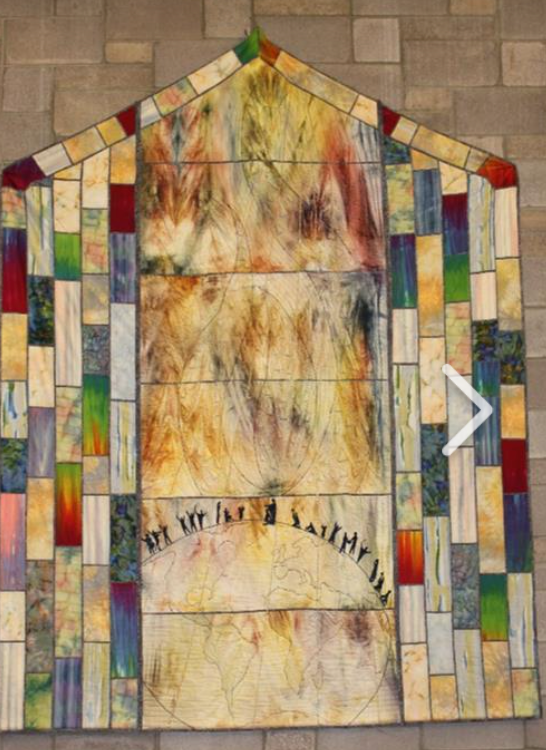 The quilted background is stitched with energetic lines to suggest tongues of flame reflecting the Pentecost experience. 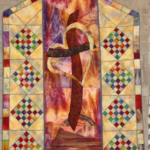 On the opposite wall, “Beyond the Cross” suggests the cross is made from glass, indicating transparency. Using an overlay of organza, the material reflects the idea that the crucifixion was not the end, but that we can see beyond the cross. The Resurrection and the development of Christianity have more focus. The viewer’s eye is led upward along quilted rays to the lightest section. In both life and death, we are attracted to the Light. 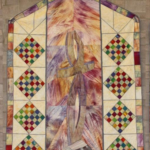 The side panels resembling stained glass were pieced by congregation members. All their names are recorded on the backs of the quilts. 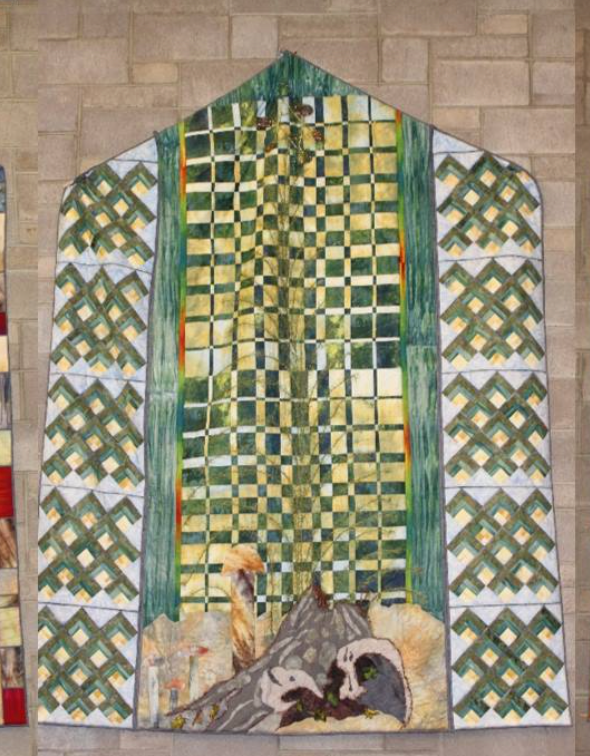 The pair of quilts that are predominately green depict nature and growth. The Vine and the Branches relates to Jesus speaking to His disciples. The vine is strong and sturdy with years of growth. The branches representing the people of God are more delicate and wandering, but are still growing. 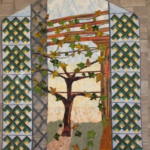 Next to the quilted section is a transparent area to which the vines cling, revealing some of the block wall that everyone wanted to cover. 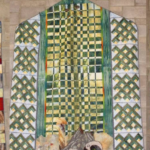 The wall has merit and design, too, so it is incorporated into the design. It was challenging to depict a naturally horizontal element in a vertical space. The leaves add a light and lyrical quality which balance the lines. Some leaves are appliquéd while others were minimally stitched to make them curl and give further dimension. The Jesse Tree theme was chosen partly because it is intriguing and also because our Christian heritage begins with Christ’s lineage to Jesse. There is an impressive 12th Century Jesse window in Chartres Cathedral but after the 15th Century the Jesse theme became nonexistent. This example shows a gnarled stump at the bottom among the mushrooms, giving birth to shaggy green yarn representing a tree form rising like a fountain. The arching branches represent the many generations from Jesse to Christ. At the top shines a star of David encircled by sparkling shapes. Harmonic convergence is the name of the background construction technique which seems appropriate for a congregation. Side panels on both quilts resemble lattice. 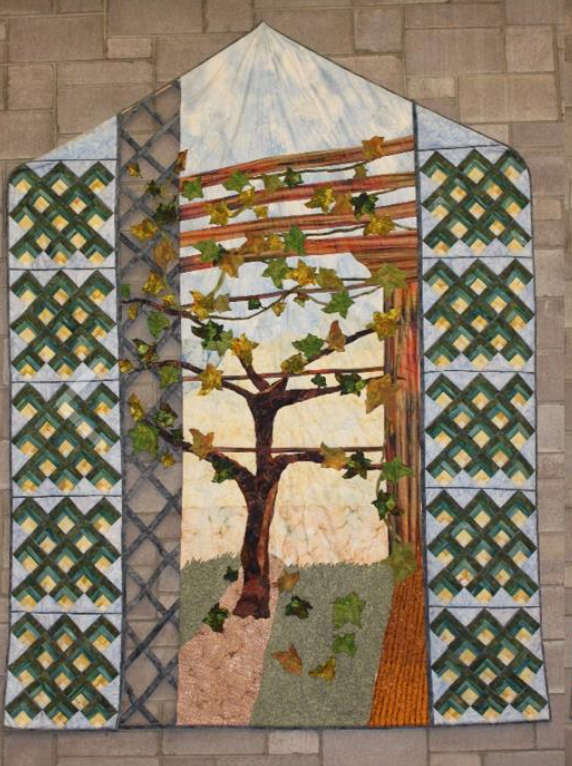 Each side has 522 pieces which congregation members, by now highly skilled, pieced for the botanical effect.